I know. I didn't find out until last night, when I went out to eat with a few friends, and one of them raised a toast to Robin Williams. That's when they told me. God, and he killed himself too- that's what really gets to me. Talk about the proverbial sad clown. Aww, that is awesome. Both the vid and that you got to talk to him a bit. The whole thing makes me want to get into psychiatry even more. There's so much that needs to be done. He had a club date in the area, so we lucked out in having him come in. No entourage either- just him. I always wondered if he played Portal(I've got it on my own macbook). I just watched a podcast today talking about how his initial interest in comedy was sparked by the fact that doing impressions of his grandmother as a child would make his mother laugh. I guess it was the only time she would really pay any attention to him. Then when he was in school, he would clown around to keep kids from bullying him. 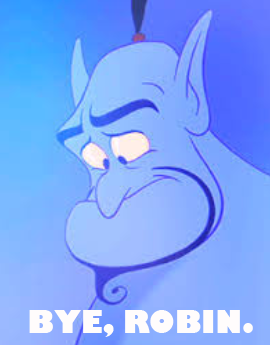 A lot of great actors and comedians seem to have talent born out of sad things such as tragedy, loneliness, etc. Hell- musicians too. Just look at John Lennon or Kurt Cobain. Music helped them cope with crappy family lives and other crap.